This is my limited edition card collection designed exclusively for Target in 2006. I was thrilled to be part of a select group of artists that Target showcased in their Artist Gallery series. 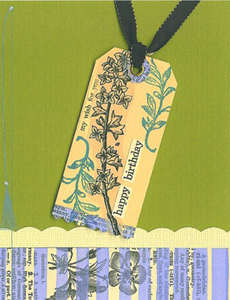 These cards are collages of my original stamp designs, vintage prints and millinery supplies, hand-painted papers, and text cut from books and dictionaries. They were a blast to create with their contemporary blend of vibrant fashion colors and vintage ephemera. Charms and rhinestones added a final sparkle! and may not be used without my express written consent.